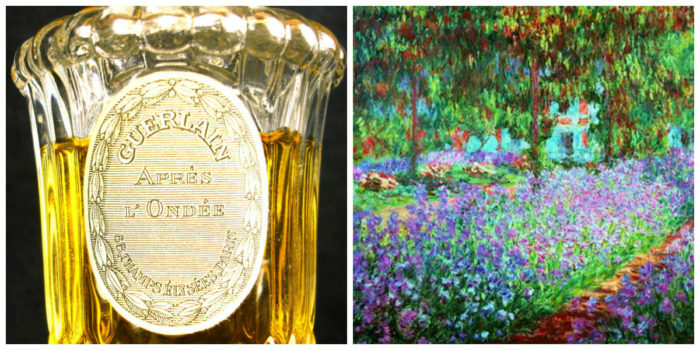 A garden lies at the heart of Guerlain‘s vintage Apres L’Ondee, a secret garden pulled straight out of Frances Hodgson Burnett’s famous 1910 children’s classic by the same name. It’s a magical place awakening after a long sleep, brought back to life in early Spring, reborn with tender efforts that make its once untamed nature a thing of the most civilized Edwardian beauty. It’s an exquisite portrait, even a heartbreakingly tender one, where fields of iris and violets sprout to spread their wings in the morning light, their petals glistening with dew and the last traces of Spring showers, their fragile bodies shooting up out of dark, loamy soil to bloom against rambling thickets of rose, sweet jasmine, and green walls covered with climbing vetiver and mossy greenness. The morning light is bright, fresh, and crystal clear, offset by gleaming rays of yellow citrus freshness and clean aldehydes, but a mist of sweet powder swirls through the air like pixie dust and tiny fairies.